Flamingo Pool Supply offers a variety of high quality automatic pool cleaners for inground and above ground pools. 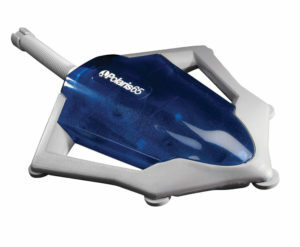 The Polaris 65 is Polaris’ best above ground automatic pool cleaner. It installs in minutes and is suitable for all aboveground pools up to 5-feet deep. It loosens debris in hard-to-reach places and traps large debris, like leaves and pebbles, in its own filter bag. The Polaris Vac-Sweep® 65 is designed for all aboveground pools up to five feet deep, even those with an uneven bottom. Installs in minutes. Operates with pumps and filtration systems normally found on aboveground pools and vacuums the bottom and sweeps the sides in three hours or less. Patented jet sweep assembly blows water against the pool wall to loosen debris in hard-to-reach places and then sweeps it into an easy-to-remove filter bag. Powered by the pressure of clean water returning to your pool, leaving both the filter and skimmer free to eliminate contaminants. Unique filter bag removes debris before it reaches your pump basket or filter, prolonging the life of your filtration system.